A Jerusalem court has ruled that the city's annual gay parade should be allowed to take place next Thursday as originally scheduled. The decision overturned a ban on the event by the city's council, which had said the event would be "provocative" and set off unrest. 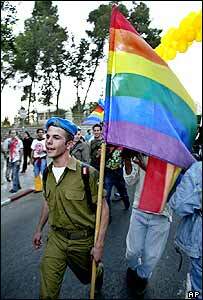 The judge ordered Jerusalem's mayor to personally pay 30,000 shekels ($6,600) to the city's gay and lesbian centre. He said this would cover the group's legal costs and underwrite the event. In addition, Judge Mussia Arad ordered the council to pay and additional 30,000 shekels to the group, and to line the parade route with banners representing the group in advance of the event, as the city customarily does for other parades and cultural events. In her ruling, the Jerusalem district court judge said the city did not have the right to prohibit the parade, arguing that the mayor could not act with prejudice against a group of people because he disagreed with their views. The event has been held for the last three years and previously passed off peacefully, albeit under heavy security. Three months ago, Christian, Jewish and Muslim religious leaders held a news conference calling for gay festivals in Jerusalem to be banned. They said a gay parade through the city could spark violence. One Muslim cleric suggested gay events in Jerusalem would attract divine wrath similar to that which destroyed the biblical city of Sodom. Several weeks ago, Jerusalem's gay and lesbian centre - Jerusalem Open House - postponed an international gay event, Jerusalem WorldPride 2005, that had been scheduled for August and would have coincided with Israel's planned Gaza pullout.